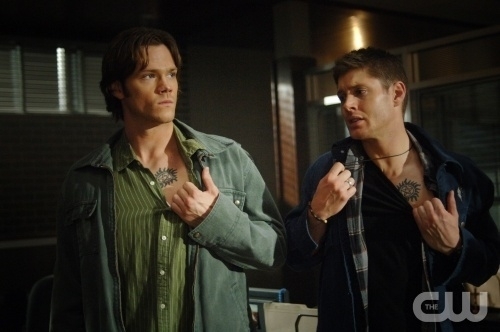 Ok, I admit it, I’m addicted to the tv show Supernatural. It’s my guilty pleasure (ok, maybe I don’t feel too guilty about it). 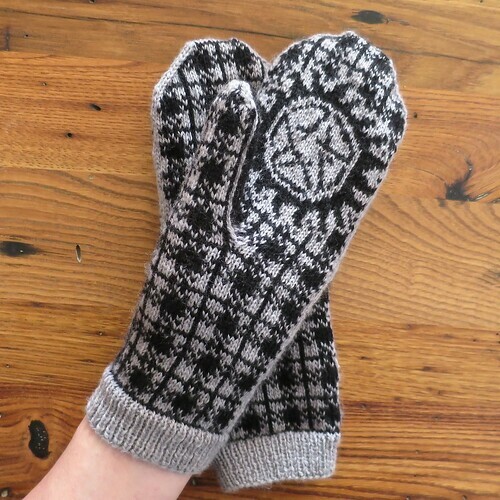 So, when I started thinking about an inspiration for my October mittens I figured what could be more perfect than a show about demons, monsters and angels. 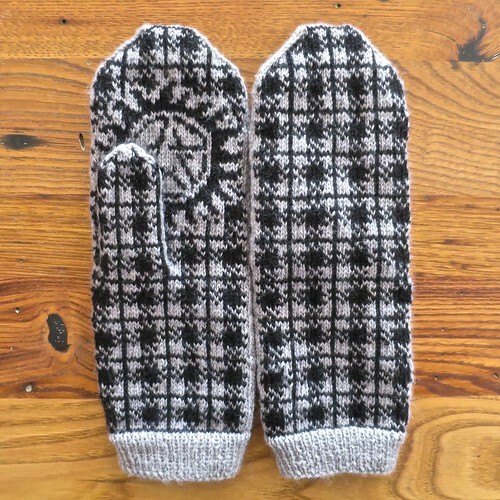 These mittens are designed to protect your hands from the cold and your body from demonic possession. I made these for me, so they are a women’s medium. 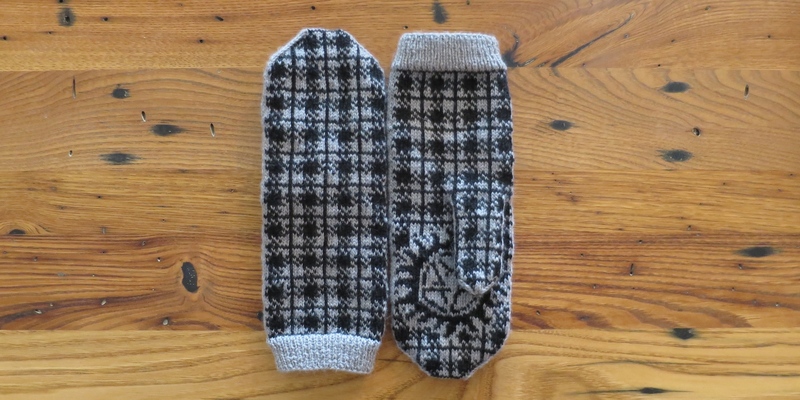 The pattern is pretty unisex, my husband really likes them, and by changing the gauge you can easily change the size. 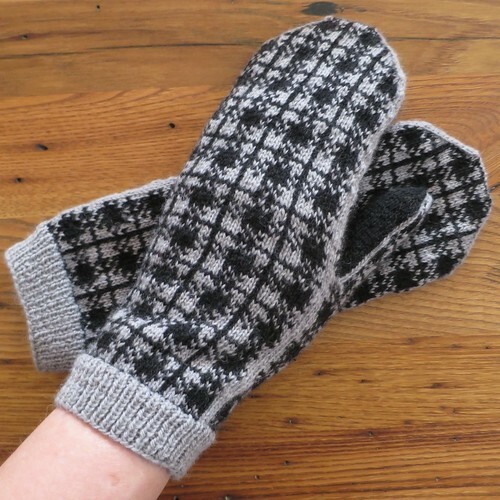 Knit them at 9 stitches per inch for a men’s medium (8.5 inches) or 8.5 stitches per inch for a men’s large (9 inches). A sport weight yarn would probably be a good choice for the larger sizes. Cast on 74 stitches. Divide between three needles. Join together to knit in the round being careful not to twist stitches. Place a stitch marker between the first and last stitch to mark rows. Cut leaving about a 12” tail. Seam the top of the mitten with kitchener stitch. Follow the correct chart for each hand. Carefully remove the scrap yarn putting the bottom stitches on one needle and the top stitches on another. Fifteen stitches on each needle. Now divide the stitches between three needles placing a stitch marker to mark rows between the top and bottom stitches on the right side. Cut the yarn leaving about a 6” tail. Put the tail on the tapestry needle and weave through remaining stitches on the needles. Pull tail inside and pull tight. Another great project. Kinda digging the plaid. Thanks! It seems like a “guy” pattern, I think they are Matt’s favorite. Awesome! I love that personal story that comes with them. It’s been a while since I watched Supernatural. I used to love it so I might have to watch them all again. Great job, Kat! I have been binge watching on Netflix and Season 9 just became available. It’s a much darker show than it used to be but I still love it. I seem to be the rare Sam girl. I mean I would bake Dean a pie, but Sam’s puppy dog eyes….